Pan's massage are by appointment only. Trap nerves, physical injuries, migraine, tennis elbow, lower back pain, slip disc, sciatica, knee problem, twisted ankle, Parkinson's, Stroke recovery, stress, etc. 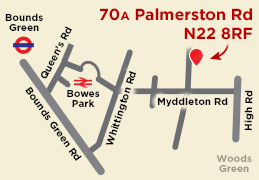 Pan's Practice is located 8 minutes walk from Bounds Green Tube Station (Piccadilly line) in North London.
" ... My advice to anyone contemplating a course of treatment with Pan is to persevere for at least 3 sessions of 2 hours and then experience the results"